FronteraFest 2016 is gone, man, solid gone. Check back in late August 2016 for participant applications for FronteraFest 2017. "The fringe theater event of the Southwest!" That's right: it's time to heat up your winter nights again, with the 23rd (personality test: does 23 make you think "skidoo!"? or "OMG the Illuminati!"?) season of FronteraFest at Hyde Park Theatre. The Short Fringe, the Long Fringe, BYOV, or Mi Casa--as always and ever, FronteraFest is five weeks of alternative, offbeat, new, and just plain off-the-wall fringe theatre. Too bad there's no actual way to expect the unexpected, because that is your only hope. FronteraFest is produced in collaboration with ScriptWorks, a group dedicated to supporting emerging playwrights and developing new dramatic works. Just want to cut to the chase? Here's a handy calendar of all FronteraFest events. Every night we present a new, unjuried bill of four or five plays no longer than 25 minutes each. Brilliant monologues? Plays in progress? Comedy improv? Cabaret singers? Avant-garde dance? Short films? Multimedia? We've seen it all. Every Saturday night is a juried "Best of the Week" performance, and the last week, February 9-13, is the juried "Best of the Fest"--with a few wild cards thrown in. Show descriptions and tickets are now available. And hey! Please come to the closing weekend party after the show on Saturday, February 13 at Dane's Body Shop next to Hyde Park Theatre. 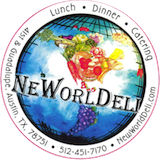 We'll have drinks on hand and New World Deli and The Parlor will feed you up right. A day of site-based work performed in local homes and other surprising locales, Mi Casa is consistently one of the most popular components of our festival. Spend just an hour with us, or the whole afternoon. This year Mi Casa is curated by playwright, performer, and theater-maker Diana Lynn Small. It features fifteen performances--theater, dance, poetry and more--at four East Austin locations in a walkable area around Ortega School Park. Download a PDF program with a map and more details about the shows. Don't miss the afterparty at the last location, 4:30pm - 6pm. See you there! Please note: there are no advance sales or reservations for Mi Casa. Tickets are $5 per location (or $15 for the whole afternoon) payable in cash only. See the whole list of show descriptions and buy tickets here. We're very sorry to announce that due to permitting issues at Ground Floor Theatre, we have had to cancel this year's Long Fringe. Long Fringe patrons are being issued full refunds. The good news is that four Long Fringe participants have moved their shows to new venues--see the BYOV page. Hyde Park Theatre is located at 511 W. 43rd Street. Covered off-street parking for the patrons of HPT is available during performances in the lot at 4315 Guadalupe Street, just north of The Parlor. You can drive through The Parlor's parking lot to reach it. Evening HPT parking also available at Kenneth's Hair Salon, just south of HPT, and at the Hyde Park Church of Christ on the northeast corner of 43rd & Avenue B. We are grateful to them all for their generosity. This project is supported in part by the Cultural Arts Division of the City of Austin Economic Development Department and by a grant from the Texas Commission on the Arts and an award from The National Endowment for the Arts. Art Works.